We look forward to assisting Cetas HC clients on complex commercial issues related to sales force effectiveness, forecasting and promotional spend optimisation. Cetas Healthcare, a specialist medical technology marketing consulting and research agency, announced today that it is expanding its business services portfolio, as well as reorganizing into three practices in order to better serve the increasing need for end-to-end marketing services. Effective immediately, Cetas Healthcare will be organized along three practice lines – Market & Customer Insights (led by Sumit Mehta based in Singapore), Strategy Consulting (led by Gopal Sundaramoorthy, based in Albany, NY, USA), and Sales & Marketing Analytics (led by Shashi Kumar, based in Mumbai, India). 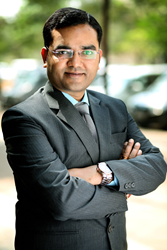 Shashi Kumar joins Cetas Healthcare with a strong background in sales, marketing and analytics solutions. He has a bachelor’s degree from IIT-Bombay, and an MBA from IIM-Ahmedabad.